Anderson was on Little House for its entire run portraying Mary Ingalls, from 1974-1981. 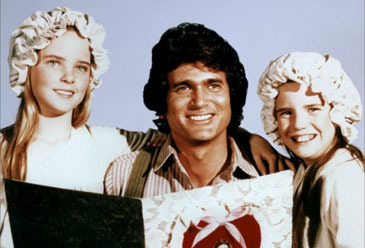 The series also featured Michael Landon, who created another memorable TV character as Pa Ingalls, and Melissa Gilbert, who was Mary’s sister and the main character on the show, Laura Ingalls. Anderson’s memoir focuses specifically on the Little House years. HolllywoodChicago.com interviewed Anderson in Chicago right before a recent book signing at the Borders Books in Lincoln Park. Her insights included her adventures in 1970s television and her association with Frank Sinatra, Jr., when they dated. HollywoodChicago.com: How did the original Laura Ingall Wilder’s book series for Little House help you in your characterization of Mary, and throughout your long run, did you ever go back to them when you needed inspiration? Melissa Sue Anderson: No. [laughs] I read them when I was a kid, before I got the series, but I think our scripts were – I hate to say it – better than the books. They were certainly more interesting, because the other characters were developed more fully on the show than they were in the books. HC: Now that you’ve had more life experience and are raising kids of your own, what do you see as the most positive effect that Little House offered and what do you think the Ingalls family can teach us post the millennium? MSA: It obviously teaches great family values and the importance of being a family unit. It’s very easy nowadays to be all spread out, with each person running somewhere else and not being together very often. So those things were then and are now very important to try to be a cohesive unit as much as you can. HC: Have your children watched the show and commented on it? MSA: They have a little bit, not that many, maybe about seven episodes, because I had retired by that time to take a step back so that they could be the focus. So they didn’t realize it was such a big deal. I think if they realized what a big deal it was they might have watched more of them. My 19 year old daughter just met me on this book tour in New York and I think I managed to impress her, [laughs] because people were asking me all these questions and were very excited. Now they’re starting to see it was a big deal. HC: What appreciation do you think the admirers of Little House derived from the era of American social history that the show was set in? MSA: I think fans watching the show get the same feeling that young kids get reading the books. The thing that the books were great at was making you feel as though you were there. I think our show did that for the TV audience, they were able to feel as though they were part of that time. HC: Michael Landon seemed to be a well-liked individual in the business. Since he worked so much as both your co-star and series director [he helmed 75 episodes], what did he teach you most either about series television or show business? MSA: Over the years, even as an adult, I went for advice from him. I think I reminded him of himself when he started out, even though I was much younger than he when he did ‘Bonanza.’ We both wanted to learn so much. I was different from the other kids on the show. Melissa [Gilbert] and I have only one and a half years difference in age, but at the time there might as well been five. I never knew if she wanted to be there or not. She worked hard when she had to, but she also like to play. Me, on the other had, I was madly trying to take it all in, because I knew this is what I wanted to do with my life. I was quite serious. HC: What do you think Landon’s very public battle with cancer and subsequent passing at a relatively young age brought to the American cultural landscape? Do you have an opinion on that? MSA: It might have been one of the first times a celebrity came out so publicly with an illness. And it just was unfortunate that he only survived three months. I think he did it because he knew he had too, he didn’t want to be found out by the press, because maybe he thought it would have been worse. It was fortunate in a sense that he got to see how much he meant to people. HC: You were a child actor during the 1970s. What was different for actors then that you simply don’t observe now? MSA: Well, we didn’t make the kind of money that kids make now. [laughs] The business was different, it was much more creatively run. It was still a business, but shows were actually given a chance. Little House would never make it now, it was too slow. That is something about the times that are different as well. I think our show was a quieter and more slowly paced drama, and I don’t know if people would sit through it now. And also we’d never have a chance to find an audience with such a show. The business now would never give us a chance. And of course, there is no Mike Landon. And that show would never have sold if it wasn’t for Mike Landon. HC: You’ve done a Brady Bunch, were in the memorable TV Movie ‘James at 15’ and did Little House on the Prairie. Were those type of television choices better when we were kids or was it just a reflection of both the era and the way the business was back then? MSA: It was a different time. And I don’t watch the kind of after school programming anymore that’s around today. I would tend to think it was better. Those shows are still loved. HC: What type of role or acting challenge would you like to have that casting agents haven’t considered you for and why? MSA: I think the only thing I haven’t had an opportunity to do is a lot of comedy. I’ve done some on stage and I’ve done a couple ‘Alfred Hitchcock Presents.’ The second one I did was a comedy, with a character that talks to the camera and never stops talking. It was a funny character. The thing that I haven’t done is a sitcom, and no one knows that I’m funny. If people read the book, you can get my sense of humor. HC: Finally, can you tell us something about Frank Sinatra, Jr. that the rest of the world doesn’t know? Did he ever express to you how he felt being in the shadow of his famous father? MSA: No, he didn’t have to, it was pretty obvious. I write about that in my book, too, that being a child of a celebrity is a very difficult thing. And a lot time those children have to have a talent, as if it were passed down. But even if you are that good, you’re always going to be compared to the famous parent and you can’t win. He’s very talented, he’s very serious and I write in my book that he has a very eclectic group of friends, he’s very interested in people. He’s much more a musician than an actor, a great pianist and composer. He’s a phenomenal singer. HC: Did he ever tell you about that kidnapping incident he experienced in 1963? “The Way I See It: A Look Back on My Life on Little House” by Melissa Sue Anderson is available at Borders Books and wherever books are sold. The complete series and single seasons of “Little House on the Prairie” are available on DVD through Lions Gate Entertainment. Submitted by DAVID ENGLISH (not verified) on June 20, 2010 - 10:42pm.